We have a core belief here at Murray’s. Snacking should be fun, and as close to effortless as possible. After all, the point of a snack is to spend as little time preparing, and as much time eating as possible. Grab some of our new “Made By Murray’s” prepared foods from our Bleecker Street or Grand Central store and get your snack on without breaking a sweat. 1. Toast bagels on cut side until golden brown. 2. Spread Liptaur dip over each bagel slice, approximately 2 tablespoons per slice, and transfer to indivdual serving dishes. 3. 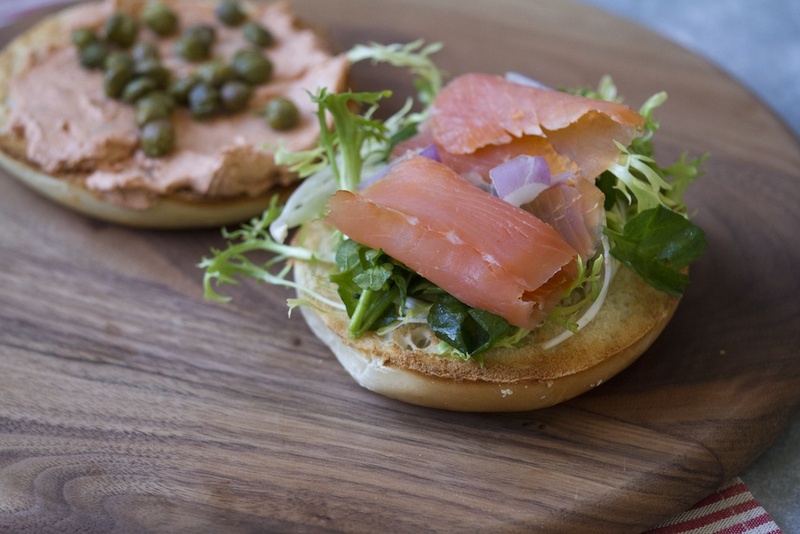 Layer each bagel half with slices of smoked salmon. 4. In a small bowl, toss together the red onion, frisee and watercress and gently add olive oil. Dress the red onion and greens with olive oil and lightly season with salt and fresh cracked black pepper. 5. Garnish each bagel slice with the salad and serve immediately. 1. Cut the bottoms off each head of endive and gently separate the leaves. 2. Put Murray’s Blue Cheese and Carmelized Shallot Dip into a pastry bag with a medium sized tip. 3. Halve and core the apples and thinly slice them lengthwise. Lightly dress the apple slices in lemon juice and olive oil and set aside. 4. Roughly chop the candied walnuts into a medium course consistancy and set aside. 1. Pipe a nickel sized amount of Murray’s Blue Cheese and Caramelized Shallot Dip onto the base of each endive leaf. 2. Top each endive leaf with approximately 1 tsp of Murray’s candied walnuts. 3. 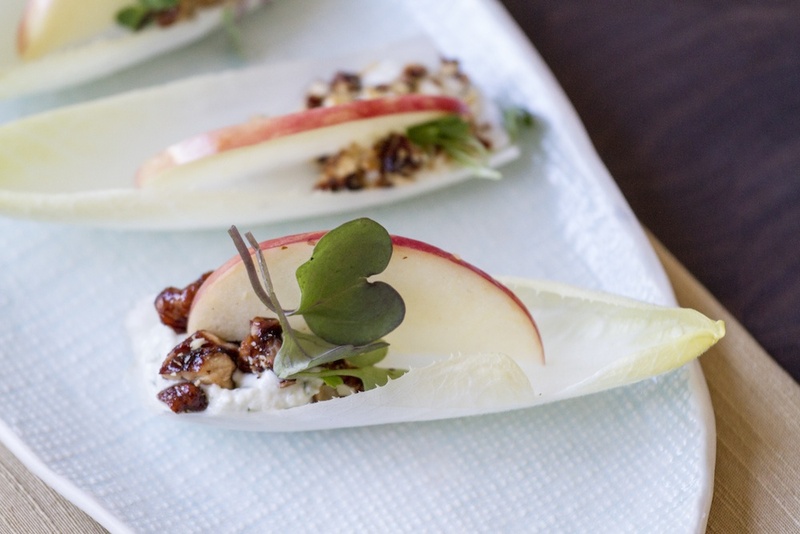 Layer each endive with an apple slice and garnish with micro greens. Transfer endive to a serving tray and enjoy. 1. In a large pot, season the pasta water with salt to taste. Pasta water should taste like the ocean. Add a ½ cup of olive oil and bring to a rolling boil. 2. In a large saucepan heat on a low flame Made by Murray’s Lamb Meatballs and cover until meatballs are hot in the center and sauce is heated through. 3. By this time, your pasta water should be at a rolling boil, add the fresh fettuccini to the water and cook until al dente, approximately 4-6 minutes. 4. Using tongs, remove the fettuccini directly from the pasta water to the saucepan with the lamb meatballs and combine well. 5. 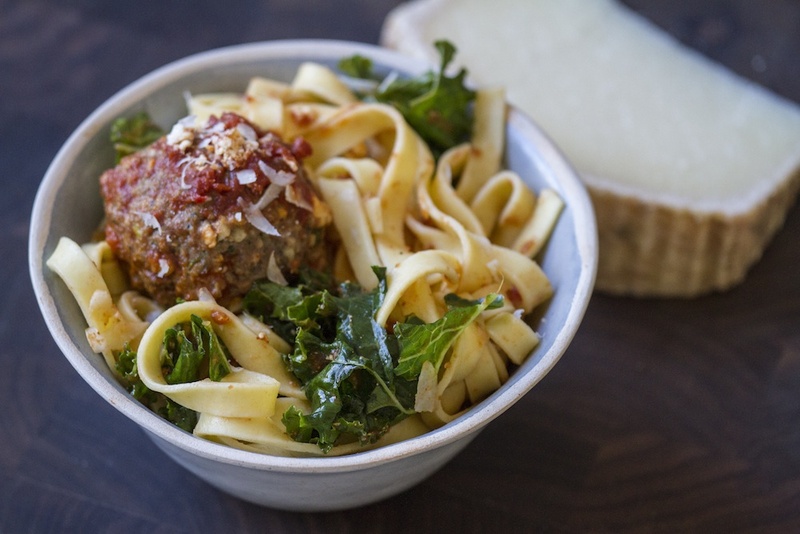 Toss in Murray’s Marinated Kale salad and portion into bowls. 6. Garnish with shaved podda classico and serve immediately.